01. Al-‘Iyāfah is the driving away of birds. Among the people in the times of pre-Islamic ignorance were those who would practice this. They would say: If the bird flies to you from right to left then it means such-and-such. And if it comes directly at you, then it means such and such will occur. If it comes to you from behind you, then such and such will happen. They would claim knowledge of the unseen from this flight of the birds (‘iyāfah) and would believe these things actually happen. For this reason, it is counted as a type of magic. 02. Drawing of lines with stones (at–tarq) on the ground was for the purpose of claiming knowledge of the condition of those who are absent, and claiming that a person will arrive on such-and-such a day and other such matters from the news of the unseen. So, these are lines in the sand. 03. There occurs in a hadeeth where the Prophet (salallāhu ‘alaihi wa sallam): “There was a Prophet would draw lines so whoever’s line agreed with his line then that is in his favour.”  Meaning: The drawing lines for that Prophet was permitted and not forbidden (because it was in accordance with what was revealed to him). Shaikh Ahmad Ibn Yahyā said: Explaining the term at–Tarq in the first hadeeth above to mean drawing lines on the ground is a point of differing. But what we have said is correct. Meaning that a person increases in magic with every increase in the knowledge astrology. Why is the magician considered to be a mushrik (polytheist)? Because he depends on foul satanic spirits in his performance of magic, and he seeks their aid. So that is why he is a mushrik. And also because he cannot make his magic complete except by doing what is mentioned in the narration of blowing on knots, etc. 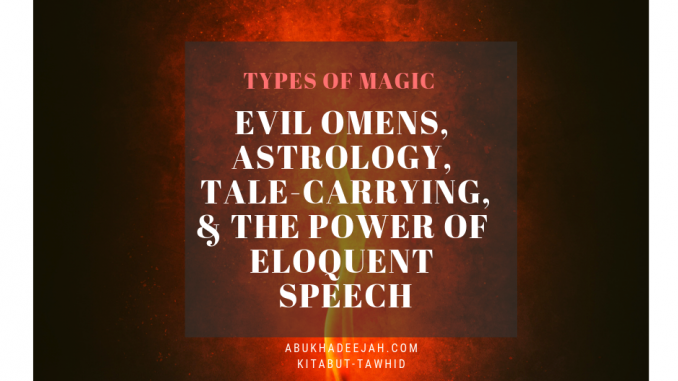 Rumour-mongering is referred to as a type of sorcery — and it involves slander and lying in order to cause corruption in the hearts of the people just like the corruption caused by magic and sorcery or even worse. So rumour-mongering is to carry tales that lead to corruption. So, the one who carries a tale from one person to another with the intention of causing discord enters into the meaning of this hadeeth. He has achieved what the sorcerer desires to achieves in terms of harm and destroying the love that existed between people; filling the hearts with bitterness, malice and rancour, to the extent that a man erupts with anger and rage towards his brother. So this is the great harm that results from nameemah (rumour-mongering) just like what is achieved through magic, if not worse! 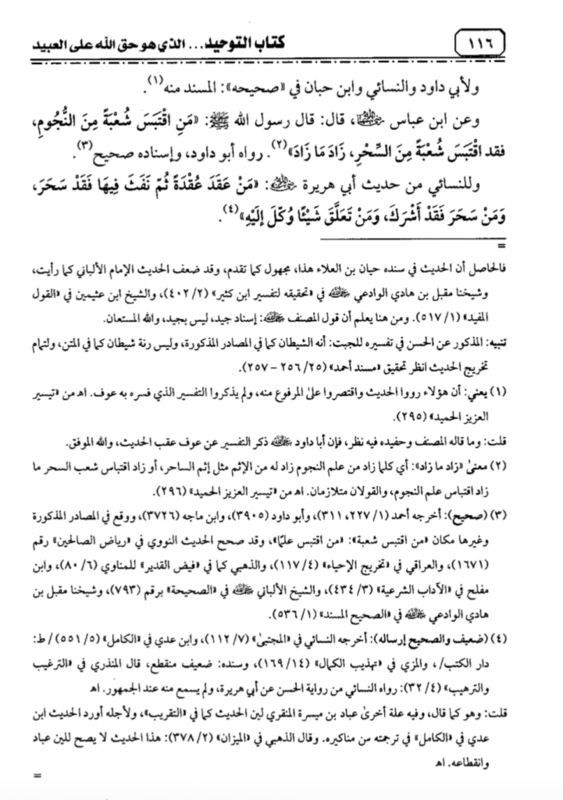 Reported by Ahmad in Al-Musnad (60/5) (20623), Abu Dawood (3907) – declared weak by Al-Albāni declared it to be weak in Da’eef Al-Jāmi’ (3900). 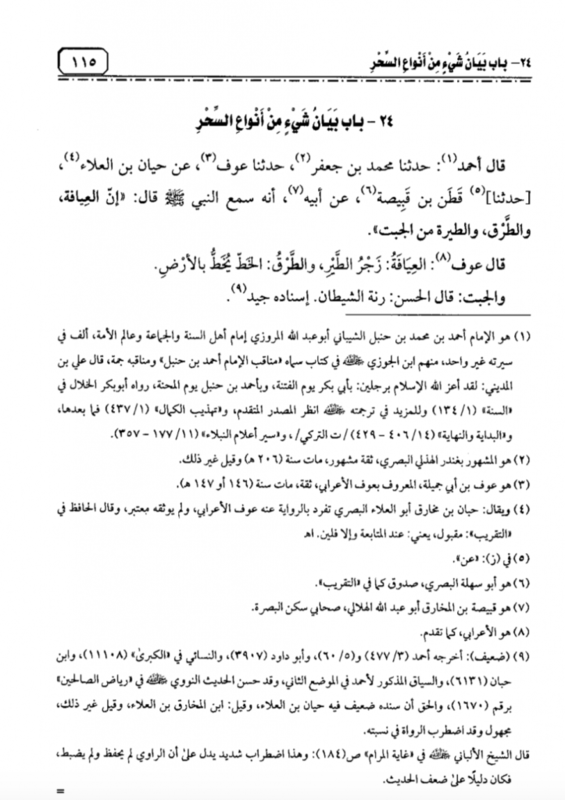 Abu Dāwood (3905), declared hasan (authentic) by Al-Albāni in Saheeh Ibn Mājah (2002). 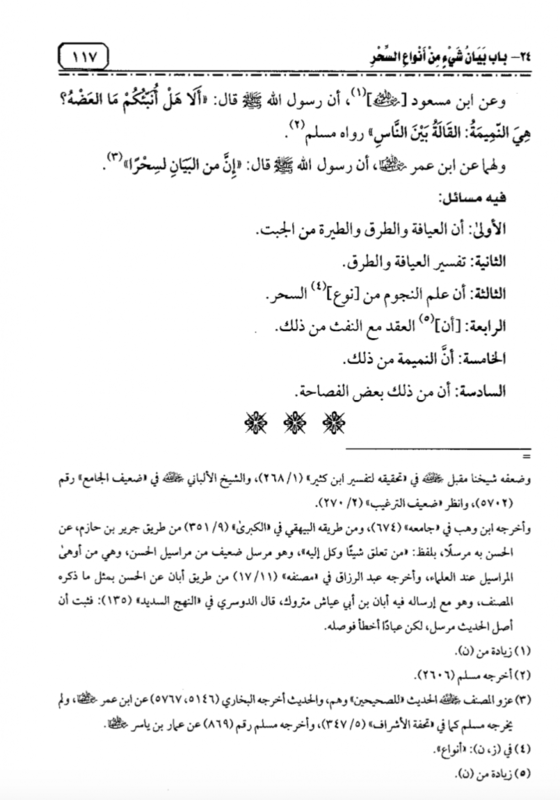 An-Nasā’ee (4079), declared weak by Al-Albāni in Da’eef At-Targheeb wat-Tarheeb (1788). Bukhāri (2680), Muslim (1813) from Umm Salamah (radiyallāhu ‘anhā).